DF-A0056 is a solid-state three-band, 5-channel DF band switch that amplifies and diplexes three omnis to two outputs, controlled by RS-485 commands. The switch accepts three frequency bands, each with 5 antenna elements. Switches route any element of a selected band (each equipped with input power limiters, ESD protection and low noise amplifier) to that band’s output. An omni channel amplifier module amplifies the three omni channels found in the DF-A0037 and diplexes them to feed the 2-channel monitoring receiver. 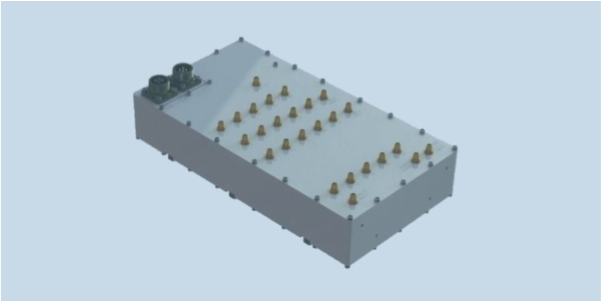 A “calibration band” can also be selected, providing a balanced 5-way split of an internally generated or externally supplied signal, for RF chain and receiver calibration. The switch accepts a wide input voltage range and is controlled via hardwired logic lines or an EIA- 485 (RS-485) interface. All switching is solid state for rapid commutation and unlimited switching cycles. DF-A0056 can be mounted within the weatherproof electronics cavity of many Alaris direction finding antennas, particularly the DF-A0029 and DF-A0037.